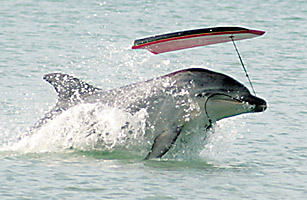 In the summer of 2008, Moko the bottlenose dolphin was a constant fixture at a beach along the east coast of New Zealand's North Island, coming by every few days to play with swimmers. But one day her visit was more business than pleasure when she showed up just in time to save two beached pygmy sperm whales. Successfully doing what humans could not, Moko seemed to communicate with the two whales and lead them safely back into deeper water. Had the dolphin not shown up, rescuers said, the mother whale and calf likely would have been killed as they had resisted human attempts to herd them to sea. "I don't speak whale and I don't speak dolphin," Conservation Officer Malcolm Smith told the BBC in 2008, "but there was obviously something that went on because the two whales changed their attitude from being quite distressed to following the dolphin quite willingly and directly along the beach and straight out to sea." See photos of animals facing extinction.